This series was created because we had a problem with a hacker that infiltrated our system and sent out emails in early 2015. After discussing the information with a couple colleagues and their experiences dealing with similar issues I was encouraged to share what I had created and why. Recall that we are storing the integer equivalent of the dotted-quad IP addresses, so INET_ATON(‘114.4.137.34’) will actually store 1,912,899,874 (without the commas) in the IP field of the table. Since we run this every 5 minutes for the system.log and every 30 minutes for each of the email, server-side SPAM logs and client-side SPAM logs, we’re running the program every few minutes. Our typical usage shows the vast majority of break-in attempts showing up in the system log, so we run that more often than the others. Where the expiration date is expressed as seconds since the Unix epoch of 01/01/1970. And that pretty much wraps up this discussion. Since I originally started writing Part I of this, I’ve incorporated a few other ideas, some useful, some just for my interest. I’ve expanded the AuthFail database to have two more fields, FileType and Line. Some of the attacks are more intense than others, with multiple attempts to break-in per second. With the original setup, those would be reduced to a single entry in the database. By adding the FileType and line number I can now identify every attempt, regardless of how aggressive it may be since it will occur on a different line number of the log file. I’ve recently added a whois contact information in another table so I can have some information if I decide to send email notifications to the owners of the sites trying to break-in. This could be automated, but I don’t really expect that this would have any impact on deterring the break-ins. 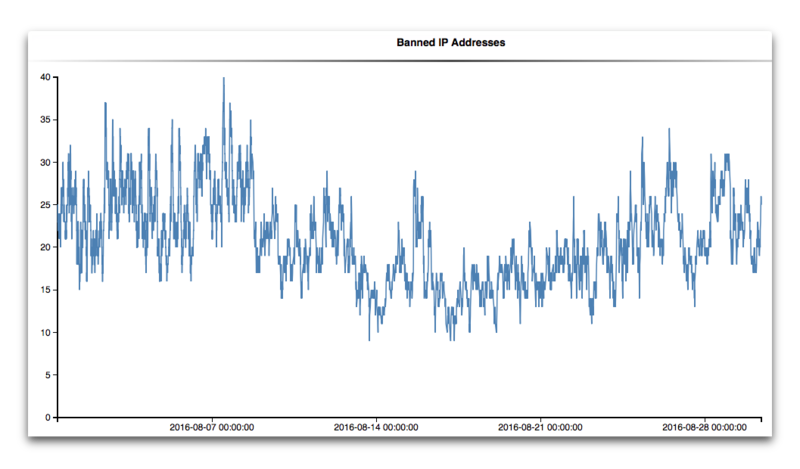 Here’s a simple graph of the number of IPs banned over the last couple months. The information is provided over 5 minute intervals.